The GEF-funded Global Wildlife Program (GWP) ensures that elephants have safe and secure land to move in, that they are away from communities with whom they share resources to avoid conflict, and that those engaged in illegal wildlife trade are prosecuted by improving evidence collection and intelligence gathering. On August 12, we celebrate World Elephant Day to raise awareness on the plight of the world’s elephant population. This is an important day for me, as the Program Manager of the Global Wildlife Program (GWP) that started two years ago to combat illegal wildlife trade across 19 countries in Asia and Africa. Funded by the Global Environment Facility (GEF) with a grant of $131 million, the GWP is a global partnership on wildlife conservation & crime prevention for sustainable development. Several of the GWP’s national projects identify elephants as their priority species, and have activities that range from reducing the poaching and trafficking of elephants to reducing the demand for ivory. By tackling the threats that are specific to each country, the GWP ensures that elephants have safe and secure land to move in, that they are away from communities with whom they share resources to avoid conflict, and that those engaged in illegal wildlife trade are prosecuted by improving evidence collection and intelligence gathering. In Mozambique, the GWP project with a grant of $15.8 million from GEF, will be implemented by UNDP and executed by the National Agency for Conservation Areas (ANAC) under the Ministry of Land, the Environment and Rural Development (MITADER), the Gorongosa Restoration Project (GRP), and the Wildlife Conservation Society (WCS). An important site of the Mozambique GWP project is the Niassa National Reserve (NNR)—the largest protected area in the country covering over 42,000 square kilometers. NNR is the most important elephant range in Mozambique, with 42% of the national elephant population (4,441 elephants). It also harbors populations of lion, leopard, wild dog, sable, kudu, wildebeest and zebra. 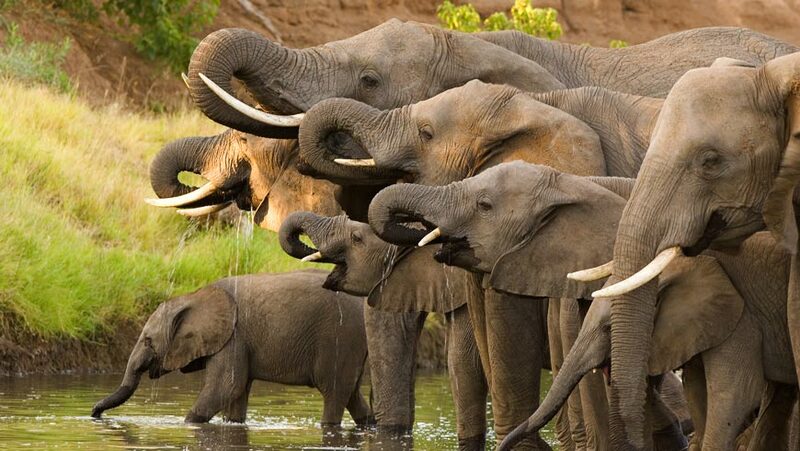 The elephant population is contiguous with the southern Tanzanian elephant population—together they were the world’s second largest elephant population, although poaching has probably reduced this status to third or fourth. Since 2012, the NNR has been co-managed by ANAC and WCS to ensure that habitat loss, poaching and illegal activities are curbed and that the 40 villages in the reserve have alternative livelihoods for local development. These agencies also employ park rangers to patrol the reserve. However, there is a lack of financial resources to support the rangers in a war against the poachers. Park rangers risk their lives every day when they patrol, sometimes unarmed, to face members of criminal networks that make the work that they do seem futile, as you can see in this video trailer produced by GWP video specialist, Raul Gallego Abellan. He is a video journalist, previously, a war reporter who decided two years ago to use his knowledge and inter-personal skills to tell the story of our planet’s endangered species in an effort to save them through photo journalism and videography. In addition to law enforcement monitoring and surveillance, the project will support co-management entities in the Niassa National Reserve, help prepare wildlife and forest management plans, train members of conservancies and relevant co-management entities in sustainable agriculture and forestry, and facilitate alternative income generation through small businesses. The GWP project in Gabon implemented by the World Bank and executed by the National Agency for National Parks in Gabon (ANPN), is addressing a problem specific to the forest elephants in Gabon. The elephant population in Gabon is the largest population of forest elephants in Africa and they are being poached in the northeast part of the country bordering the Central Africa Republic and the Republic of Congo. Due to this crisis, the remaining elephants are migrating to the southern part of the country and in doing so they come into regions with high levels of poverty where local communities live off the few crops they can plant and harvest every year. The migration of elephants from the north to the south is creating human-elephant conflict and before the situation can get worse, the $9.1 million GEF grant provided to the GWP is setting up electric fences and promoting other small-scale mitigation strategies to avoid the conflict all together. Video: Professor Lee White: Will African Elephants Survive This Generation? A small number of GWP projects in Asia include collaborating with the national governments of Thailand, Vietnam and Indonesia to combat the trafficking of ivory through strengthened customs and forensics work and educational and awareness raising campaigns. This day is to celebrate this majestic and absolutely inspiring mammal with so many human capabilities, but it is also a day to reflect on the fate of the elephants and think more seriously about how we can help avoid the extinction of this species. I am happy to say that the GWP in collaboration with GEF is pushing hard to promote more partnerships between governments, NGOs, and donors in raising awareness about the need for more technical and financial resources, especially for the rangers on the ground and for the local communities that are facing the burden of living near wildlife and the insecurity of living near poachers. If we can secure priority protected areas in Africa and Asia, and if we can change behavior of people consuming wildlife products, we can buy some time to work with communities, create value in protecting wildlife through tourism and ensure a world where elephants aren’t the next dinosaurs.